Someone too bent on realism might pass this one by. The protagonist Esther Hammerhans advertises for a boarder for her empty room--formerly the office of her late husband. To her surprise, the first person (and I use that term loosely) to respond it a huge black dog. A talking dog. A pushy talking dog. He bullies her into letting him stay, offering a large financial sum for a temporary stay. She learns, though, that he is Winston Churchill's "black dog"--the personification of his bouts of depression. Indeed, Churchill is a character in the novel as well, getting ready to announce his retirement from Parliament. Esther, who works at the library at Parliament, is looked after by well-meaning friends, trying to get her through the second anniverary of her husband Michael's death with a dinner invitation and a little matchmaking. 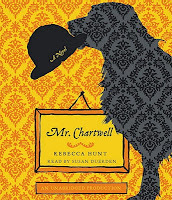 The quirky tale not only led me to read more about Churchill, but it used the "black dog" analogy beautifully to present a picture of how depression can move in and take over a life. I'll admit that I enjoy hearing a book well read in a British accent. I wonder if Brits get the same sensation from hearing something decidedly American read in a soft Southern accent. From time to time, I considered picking up the book in print to go back to some passages that invited further consideration. Maybe I still will. 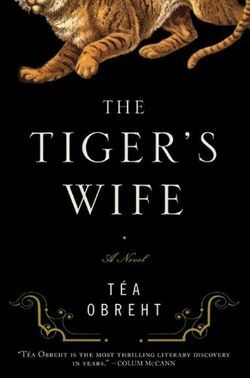 Tea Obreht's novel The Tiger's Wife was one of the Lemuria First Editions Club selections that appeared on my doorstep before I'd heard of it. After that though (as often happens with their selections), I began to hear lots of chatter from other readers. The story is told by Natalia, a young doctor, and by her grandfather (a physician himself), who tells her stories--or more precisely, variations of two stories--the deathless man and the tiger's wife. Set in a Balkan country torn by war throughout history, often spurred on by religious and ethnic rivalries, the story intertwines factual details with myths and legends--as the best stories often do--and as a result, truth often trumps fact. Having recently read two novels by Glen Cooper dealing with the impact of knowing one's time of death, I couldn't help making connections with this story, particularly the tale of the deathless man--a man cursed by immortality by his uncle Death. Because many of the stories told by Obreht's characters are told in fragments, the way we all tend to tell our family stories, the reader has the feeling of coming to the same story or even from many perspectives, particularly those of time. The novel seems to be as much about secret-keeping as story-telling, often as a proof of love and loyalty as much as a means of self-protection. Something about this book makes me believe that its small, beautifully drawn details, its complex characters will stay with me for a long time. I suspect, too, that I'll be turning to Kipling's Jungle Book soon--and not just the Disney version. After this book, The Graveyard Book, and The Jungle Law, I realize someone is telling me something. I keep revising and re-prioritizing. Something catches my attention, and another book slides back down the list. I try to imagine if I had to queue my reading list the way I do Netflix DVD orders. I'd constantly be clicking move up and move down. For now, I'm working on a couple I can't wait to share--one audio, one print--but I hear little voices over my shoulder whispering "Read me next." 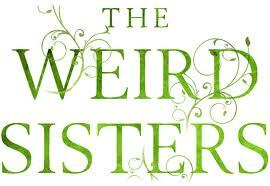 Although Eleanor Brown's novel The Weird Sisters may lack the elements of literature that stand the test of time, it offered two elements that caught my attention right away. First, of course, there's the title's allusion to Shakespeare's three witches that encounter Macbeth and Banquo in Act I. Second, the novel is a story of the relationship of three grown sisters. As a Shakespeare lover of the first order, I enjoyed the way the whole family, inspired by their professor father, work lines of Shakespeare into their conversation. The plot brings two sisters home--in semi-shame, Bean after losing a job when caught stealing from her company, Cordy, pregnant after wandering across the country aimlessly after dropping out of college. Their older sister Rose, a non-tenured math professor also returns home when her fiance accepts a temporary position at Oxford. All converge on the house after their mother's diagnosis with breast cancer and must wrestle with their own pasts and futures. Rather than playing with subtleties as she works in the Shakespearean references, Brown just goes for the obvious fun. The girls are named, after all, for Rosalind, Bianca (oh yes, the second daughter), and Cordelia, the youngest, and Daddy's favorite. 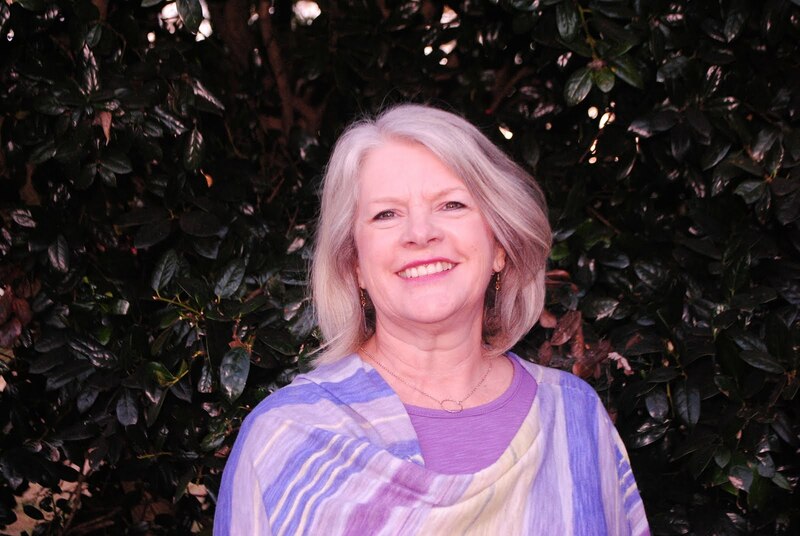 As one of five sisters myself, I had no problem believing that three sisters could be so very different or that each could be jockeying for position as the parents' favorite, always fearing disappointing the family. Returning to a small college town, the sisters must find their place (and in a way that only happens in make-believe), jobs just fall into their laps--at the local sandwich shop, at the library, at the local college. The book has no heavy message or deep meaning (unless you're really looking for one). It's just a quick fun read--and a chance to brush up your Shakespeare! I first encountered Nicole Krauss through her novel History of Love, a book that sat on my shelf awhile before I ventured in. That book reminded me in a way of Jonathan Safron Foer's Extremely Loud and Incredibly Close (and yes, I did have to look up the title again to remember which adverb goes with which adjective). Both have young narrators and weave together what at first seems to be disconnected plot lines. Both also have threads of Holocaust narratives as well. I started Great House once unsuccessfully, then picked it back up during my vacation and couldn't put it down. Again the pulls together characters with only thin connections--if any at all--in New York, London, and Jerusalem. The single connection is a large, usual desk, first introduced by a narrator (one of several) who agrees to keep furniture for a young poet returning to Chile. The desk is the single piece to which she becomes attached, eventually using it while writing her novels. The other characters include the husband of another, more famous author who owned the desk, a brother and sister whose father recovers personal items lost during the Holocaust, a son who returns home to stay with his estranged father in Israel after quitting his job as a judge in England. The significance of the title also makes a late appearance in the narrative, reinforcing the idea of collective memory. I have finally learned to highlight and make notes in my i-Book, so I can at least look back for the patches of yellow. This is not the kind of narrative for which I could provide a spoiler. In fact, this is one of the handfuls of books that I finish then turn back and re-read the last chapter or two, just to be sure I comprehend how the story is resolved. I can often (well, maybe I should say sometimes) read a book and feel satisfied when I'm finished without needing to talk about it. This is not one of those books. I have a genuine desire to go back through and chart the people, places, and timeline. I have a need to talk about this clever, intricately woven tale with someone else. I'm just not through with it yet. This past week my husband and I headed to Arizona for one of our "bucket list" destinations, the Grand Canyon. Of course, I packed more than enough to read on the way, but I have to admit that the scenery on the trip was so overwhelming that I didn't bury my nose in a book for most of the car trip. I did, however, have plenty of plane time during the cross-country trip. 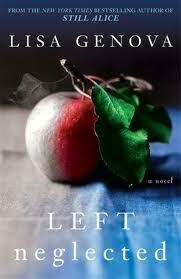 On the way there, I finished Lisa Genova's new novel Left Neglected. Her novel Still Alice, about a woman with early onset Alzheimer's was so beautifully written. The author's expertise as a Harvard-educated neuroscientist brings a credibility to her books, but her writing holds up literarily as well. In this novel, the main character Sarah Nickerson who, with her husband's help, balances a family and a powerful, high-powered career until a car accident leaves her with a serious brain injury called left neglect. Because of injuries to the right side of her brain, she can't use--or even see- her right arm, right leg; she can't see food on the left side of her plate or people on the left side of her room. The drama in the book comes not only from the changes to Sarah, but the changes in family dynamics. Her mother, who practically disappeared from life after losing a son in a drowning accident, comes back into her daughter's life. Genova introduces a group that helps handicapped individuals to ski, and she provides information at the conclusion of the book. Both of Genova's books could easily have veered into maudlin tear-jerkers, but instead, both presented women who faced tremendous life-changing events with dignity. 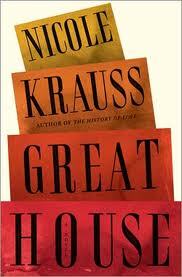 Check back in a day or two for my review of Nicole Krauss' Great House. For my review of Ann Patchett's State of Wonder from the Raleigh News and Observer, check this link.